The instructions for 1st couple on bars 15-16 have changed. 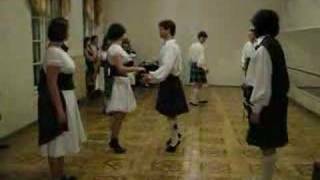 Drewry's original text in Book 23 says: "First couple, giving right hands cross to own sides, dance up to the top and turn to face the second couple who have danced in ready for the Rondel." The later Pocket Book 23 has the text: "First couple, giving right hands, dance up turning halfway round to finish facing second couple ready for the Rondel." The issue was discussed at the Technique Committee, see https://www.rscds.org/learn/resources-dancers/technique-advisory-panel-dances and search for Mrs. Hamilton of Wishaw. Apparently the old version was specified in the "Prescribed Dances for the Teacher's Certificate Examination (2003)", the new version in the same for 2008. The Committee answered: "When we reviewed the Manual [this is the 2nd. edition, 2004. EF] we looked at the latest publication (the Pocket edition in this case) and any ambiguity was referred back to the video as the final word. In this case the two are in agreement for first couple although the handing for second couple is not clear. It was felt therefore there was no need for a Manual note in chapter 7. The earlier A4 book instructions certainly imply a different way of finishing the reel in today's terminology and I doubt if there is a record of why the wording was changed - the intention may have been to change the way the reel was being danced or simply trying to "clarify" the instructions. In a further attempt at clarification, the Prescribed Dances for the Teacher's Certificate Examination (2008) now read: "1st couple, giving right hands, dance a half turn as they lead up to finish at first place on own sides in the middle of the set facing down. 2nd couple finish in the middle of the set, facing up and 3rd couple dance to places." This description now brings the movement into line with the formation shown in the video. " The E-crib follows the new version. There are now two videos. The one added on 2013-06-01 by Gert Werder follows Drewry's original instructions. The "Official RSCDS video" added on 2015-08-29 by Eric Ferguson follows the current revised instructions. Added on: Aug. 29, 2015, 10:37 p.m.
Added on: June 1, 2013, 9:43 a.m.
Budapest Local Club 02.07.2015 2015-07-02 Zoltán Gräff June 29, 2015, 10:23 a.m.
Budapest Local Club 09.02.2017 2017-02-09 Zoltán Gräff Feb. 9, 2017, 9:38 p.m.
Budapest Local Club 19.03.2019 2019-03-19 lldikó Szakolczai March 20, 2019, 8:08 a.m.
Berkeley Friday 2017-01-06 2017-01-06 Tovar - Jan. 6, 2017, 6:04 a.m.
2 Ocy 2018 HSCDC 2018-10-02 Lesley Cashell Sept. 30, 2018, 4:23 p.m.